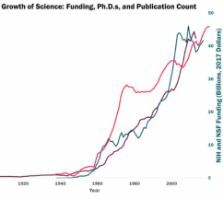 We’re Spending More On Scientific Research But Are We Getting Less For It? Over the past century we’ve vastly increased the time and money invested in science, but in scientists’ own judgement we’re producing the most important breakthroughs at a near-constant rate. On a per-dollar or per-person basis, this suggests that science is becoming far less efficient.